Cast Aluminum furniture is durable and maintenance free. Cast aluminum allows for more intricate design detail while its added weight is advantageous in high wind areas. Best of all cast aluminum does not rust. Several styles of cast aluminum are available including sling, cushion, and all cast. A variety of colors are available in cast aluminum. Aluminum furniture is extremely light weight and very practical. 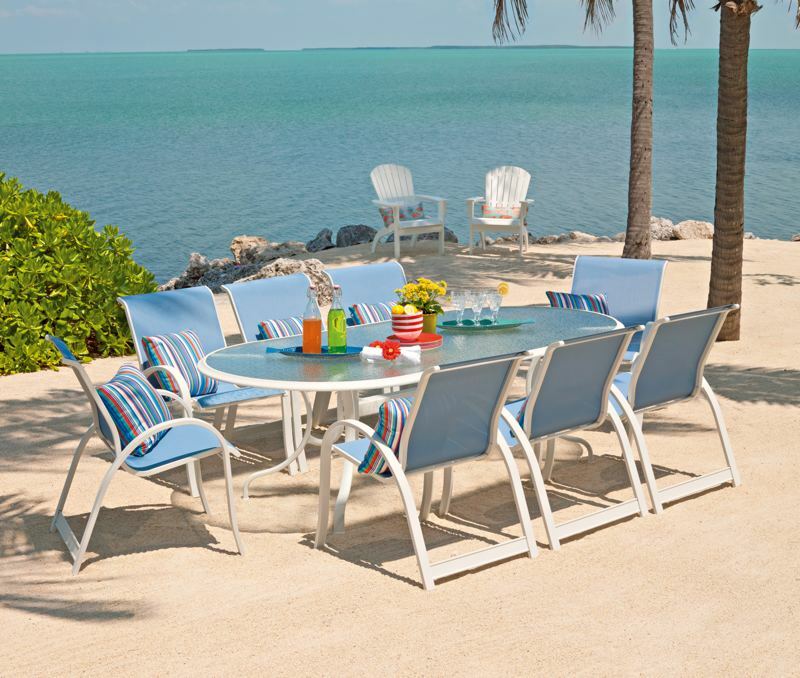 The vast selection of fabrics and colors makes aluminum the #1 choice in patio furniture. The extruded aluminum frames have warranties up to 15 years. All aluminum components are heliarc welded to provide lasting durability. Aluminum furniture is available in several styles: cushion, sling and solid aluminum extrusions. Marine Grade Polymer is crafted from recycled plastic bottles and containers that are permeated with UV stabilized coloring. MGP offers the quality, comfort, and the beauty of traditionally painted wood without the associated maintenance. Wrought Iron is known for its strength and long lasting quality. Because of its weight, wrought iron is best suited for windy areas. 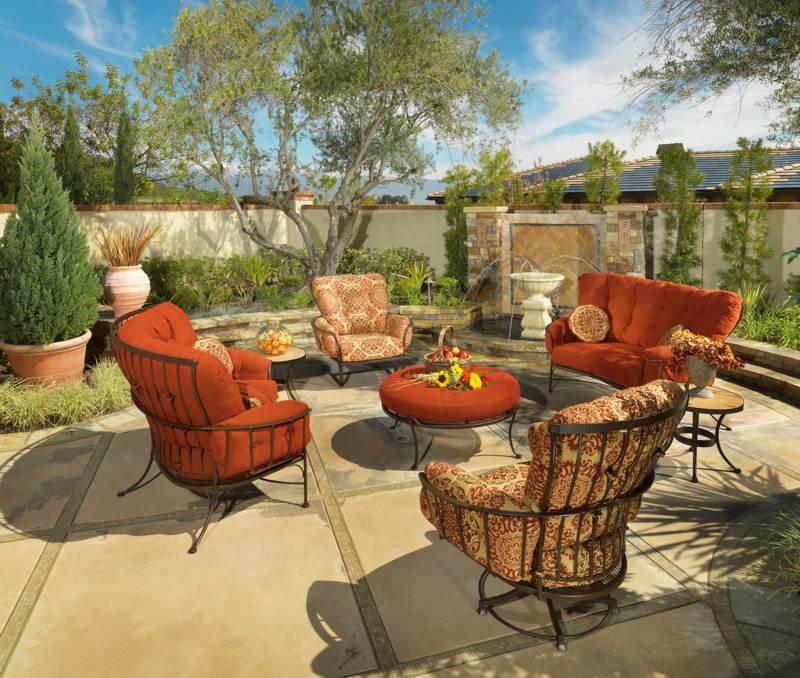 Select wrought iron for traditional designs that withstand the test of time in both fashion and durability. 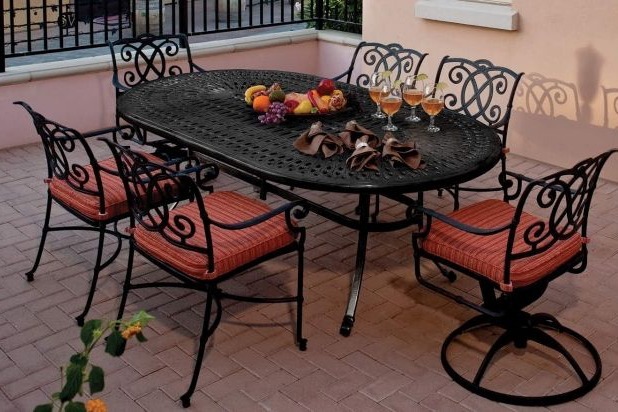 Choose from a variety of colors when selecting your wrought iron furniture. Best value can be found in wrought iron furniture. The look of wrought iron can be used in both interior and exterior decorating. 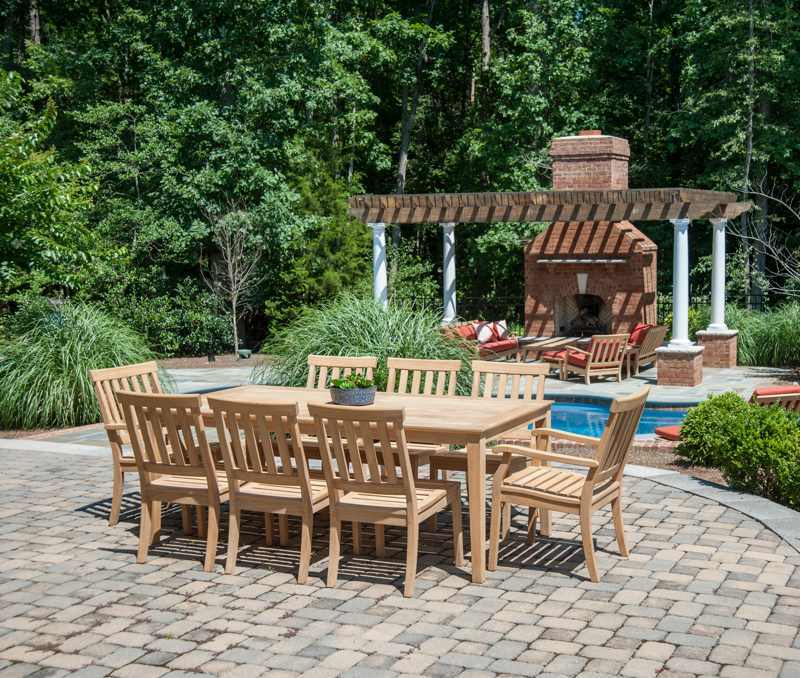 Woods collected from around the world are used in patio furniture. Dense, hard woods, such as teak, roble, and ipe are best suited for humid climates. Most wood patio furniture will transform to a silvery grey color. This does not alter the durability of the wood furniture. Fine grain wood from a rich reddish brown to a weathered grey are available. 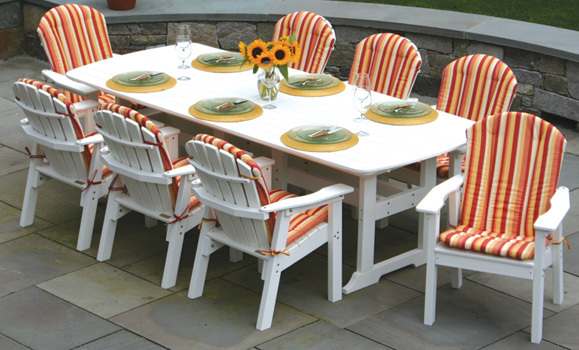 Fashion trends come and go but the natural beauty of wood patio furniture endures time. 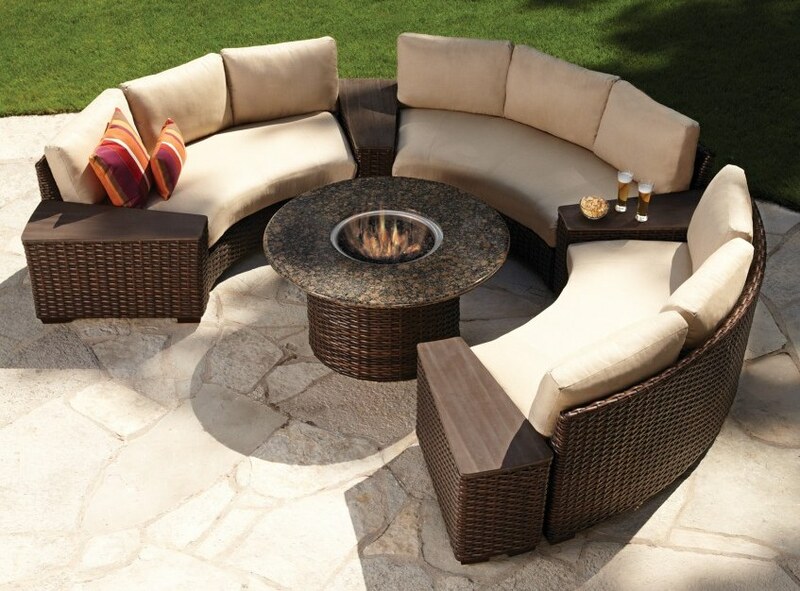 New contemporary styles or vintage looks of days gone by make wicker furniture practical for indoor and outdoor use. Wicker weaves are now constructed of all-weather proof materials. The plush cushions on wicker furniture offer comfort and relaxation. Many natural as well as bright colors are offered in today’s wicker furniture.